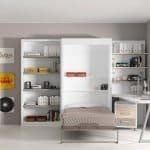 Home » Interior » Design Of Modern Bedroom Trends 2020 – how to equip an area for sleeping? 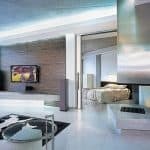 Design Of Modern Bedroom Trends 2020 – how to equip an area for sleeping? The organization of the repair of a house or apartment is a very responsible and laborious process. But the result is certainly worth all the effort. After all, having overcome the difficulties in finishing the walls, choosing the style of a room and installing furniture, we will get a space in which it will be easy and cozy. And, if the kitchen or living room should be made out both from an aesthetic and functional point of view (reception, cooking), then with the bedroom things are a little different. This is a room in which we can truly relax. And since healthy sleep takes about a third of our life, we spend a lot of time in the bedroom. That is why here the entire emphasis is placed on the fact that every detail of the interior helps to relax after a hard day. More and more people today are turning to designer services in order to get the interior of their dreams. Professionals are able not only to assess the space and choose the optimal solution, but also to shape the appearance of the room in accordance with the latest trends. Of course, you can independently design a design from the very beginning to the end. Especially now there are many sources of information, having studied which, you can competently plan the space. The main trend of fashion, which for many years has not left the catalogs of interiors, is the design of a room in the style of minimalism. Experts strongly recommend to abandon unnecessary things, surrounding themselves with exclusively functional items. This may work for any other room, but not for the bedroom. Balance is very important here – arranging furniture and accessories in such a way that everything looks both ergonomic and beautiful. The bedroom is a place to sleep, and therefore it is so important to have here even the smallest objects that will be pleasing to the eye and set up for rest. 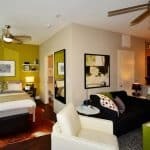 The privacy of the room – even if you have a small studio apartment, designers recommend to distinguish between a living area and a recreation area. Modern research has long proved the importance of sleep for normal human life. Therefore, it is desirable to protect the bedroom from other areas of the house or apartment. In this case, nothing will distract you from a full sleep. This can be done with the help of an interior partition, a shelving or a curtain. Large and bright space. Even if you do not have a large number of square meters, you can create the illusion of a spacious bedroom. For example, using a light shade of walls and furniture, large windows, a minimum of large furniture, mirrors, etc. Environmentally friendly materials. One of the most important trends in recent years. Modern manufacturers are trying to offer products made from materials that do not cause any harm to human health or the environment. This applies to both finishing and filling the room. Conciseness – the main feature of the modern interior. If it is possible to make at least some element of the room easier, be sure to agree to it. Even the classic finishes or fittings are transformed into a more minimalist version. The use of natural motifs. There is a clear connection with the paragraph about the environmental friendliness of all components. Finishing and facades made under natural materials (wood, stone) are in fashion. In this style, you can make repairs in any color – the palette of colors varies from light (marble, birch) to dark (chestnut, wenge). Of course, all decisions that you make during the renovation of the bedroom should be based on the size of the room and its location relative to the cardinal points. If the windows are facing east, then the room will receive a sufficient amount of sunlight, which means that you can use any shade of both a warm and a cold palette. However, if the sun’s rays are infrequent guests in a given room, the logical solution would be to finish the walls in warmer colors. In this way, the so-called “low color degree” of the room can be compensated. Compatible with any other colors and shades. You can leave the room bright and pastel, or you can add a zest to it by adding some bright accents. In any case, the light background will be in harmony with your choice. Visual expansion of space. While the dark shades create the illusion of a small room, light ones, on the contrary, give the room more freedom. Increased lighting in the room. In combination with sunlight or artificial lighting, the white or beige color of the walls makes it even brighter. In addition, any light shade unconditionally associated with purity and harmony. Rooms with this color scheme will be a great place to relax and have a restful sleep. They look quite simple, but at the same time cozy and comfortable. They have a lot of light and a sense of inner, homely freedom. White is considered particularly relevant in recent years. It fits perfectly into several popular bedroom styles – high-tech, classic and Scandinavian. Often it is supplemented with details made under wood or metal, pots with fresh flowers, bright accents in the form of pillows, paintings, sconces, etc. Brightness with the above described interior can be achieved with the help of a variety of decorative elements. The most suitable for the bedroom is, perhaps, textiles. These can be carpets, rugs, wall panels, bedspreads, decorative pillows, etc. Believe me, even seemingly small and minor details can significantly transform your room. Among the materials for wall cladding, both traditional (paint, wallpaper ) and original are popular. For those who prefer the first option, you should pay attention to a variety of velvet, velor and other textile wallpaper. Such materials seem to be created for the bedroom. They give it softness, elegance and luxury. And thanks to the large selection, they will easily fit into absolutely any interior. One of the latest trends in 2020 for the design of the bedroom is brickwork. This is a traditional material for rooms made in the style of a loft, but this solution would be appropriate in many other design solutions. You can leave the brick in natural color, or you can use a special paint and choose any shade to your taste. However, if you take a more original wall decoration, experts recommend using a combination method. Then the result will not work hard, and the room will get some zest. The method of using the so-called “accent wall” has long been popular all over the world. To do this, it is not at all necessary to combine different materials – such an effect can be achieved by using wallpaper with a photo print on one wall or paint of brighter colors. This accent is often used on the wall, which is located behind the head of the bed. Finishing the ceiling, perhaps the least problematic process. All you need to achieve the perfect result is to level the surface and achieve the maximum white color. As for the flooring, here, as with the walls, you have a huge field for imagination. The best options are parquet or laminate boards. They have the appearance of natural wood, give the room coziness and warmth, and using modern technologies are also quite wear-resistant surfaces. In addition, today manufacturers offer such a wide range that you can easily choose a coating to your taste and wallet. Undoubtedly, the central object of any bedroom is the bed. It is on it that we spend the third part of our day, so it is important to purchase such a model that will be both stylish and comfortable. In addition, the further design of the room often depends on where the sleeping area will be located. Despite the fact that when creating design projects, all the experts unanimously say that only minimalism is in fashion, the same experts say that the bed should carry a bit of luxury. Therefore, give preference to models with a large soft headboard. 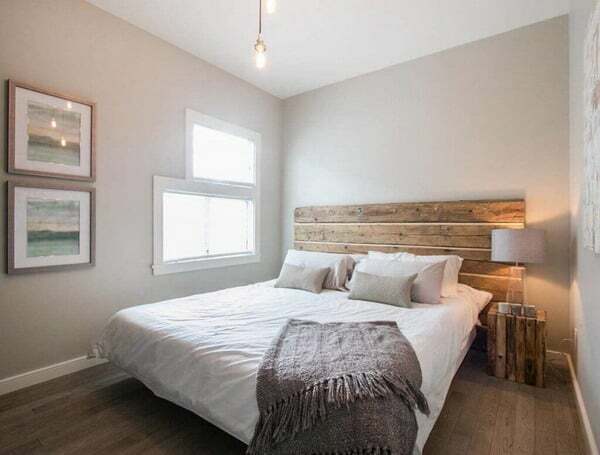 This seemingly insignificant detail will turn the bed not only into furniture for sleeping, but also into a place where you can comfortably sit behind a book or watch your favorite movies before bedtime. You will no longer be disturbed by a cold and hard wall, after which back pain often occurs. In addition to the head, pay attention to the additional decoration of the bed. Forged patterns, various inserts, canopies – these are the details that create the mood during your stay in the room. Often people have in the bedroom and their workplace. This is not surprising, because if there is no additional space, then working in the kitchen, where food is prepared, or in the living room, where guests and family members often rest, is rather uncomfortable. In this case, you can place in this room not only a sleeping place, but also a workplace. A small table will perfectly cope with this role. If you wish, you can decorate it by placing photos, candles and other small decorations on it. For those who can not live a day without a book, and there is no free space for a home library, a solution such as a shelving will do. It will look great in the bedroom, in addition, you can at any time choose a book that you want to read before bedtime. If you do not have a large space, do not use closed cabinets, but open shelves. They can be placed on the same wall or around the perimeter of the room. And placing them behind the head of the bed will create the same effect of the “accent wall”, which was already mentioned above. 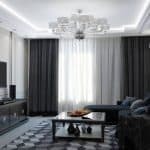 If we talk about decorating windows, then modern designers recommend not to weight the interior with thick dark curtains, but rather to do with thin tulle or rolled curtains. Such an idea, no doubt, suitable for the living room or for the kitchen. 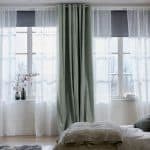 But here, when it comes to the bedroom, it should be remembered that the curtain in it is not just a matter of aesthetic pleasure, but also a way to protect it from bright sunlight. Especially in the bedroom, whose windows face east, and the rays penetrate the room in the early morning. However, you can combine the recommendations of designers and the functionality of the curtains. For example, give preference to special blinds or Roman blinds. Some models today are manufactured using a special technology that limits the ingress of sunlight to the inside. If the room, which is designed to recover from a hard day, does not have large dimensions, this is not a problem. 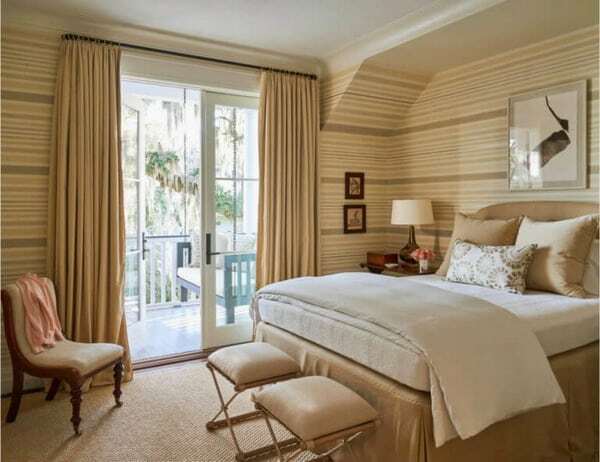 Simply know a few tricks that will help you visually increase the area of the bedroom. The most important rule is de-clashing territory. You need to get rid of all interior items that do not have any practical function. 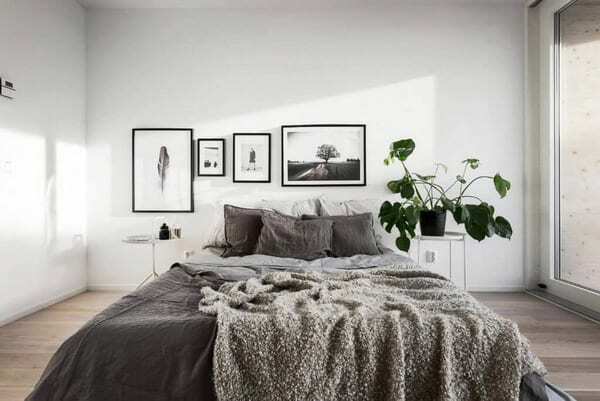 Leave only the most basic thing – a bed, a cabinet, a table (if necessary) and, possibly, a few small accessories that will complete the image of the room. As mentioned above, try to choose bright pastel shades for the room. In addition, the bedroom can be visually expanded by installing glossy suspended ceilings and large mirrors. Instead of focusing on additional elements of decor, it is better to try to decorate the room with the help of the desired items. For example, a bright bedspread or colored pillows, in addition to their direct function, can also become a highlight of the room. In addition, these components, you can often change depending on your mood. Another important point – the lighting of a small bedroom. To make the room seem larger than it really is, try experimenting with lighting. To do this, use not only one central chandelier (which, by the way, should be small), but also additional sconces or floor lamps. A secondary light source will create the illusion of a larger room. Perhaps there is no other such room in the house where we would spend 7-8 hours in a row every day. 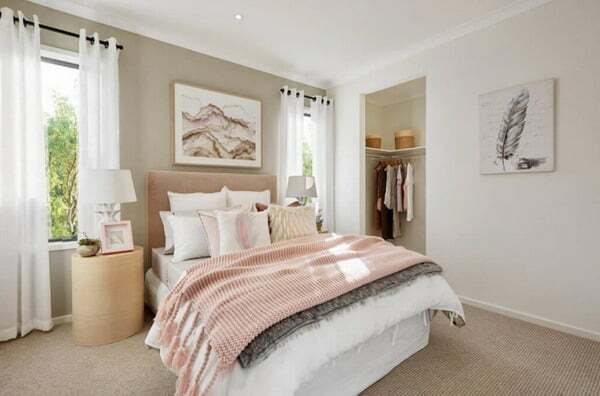 That is why it is necessary to carefully consider the interior of the bedroom. If it seems light to you, spacious and makes you want to relax and collect your thoughts, then you are not lost with design and content. Of course, all the above trends do not mean that you should plan your rest area in accordance with them. During repair, first of all, be guided by your own feelings. Think about what you want to get in the end. Only then will the result really make you happy.